By Ashutosh KS in Web Design. Updated on June 19, 2017 . When learning to code or develop software, websites or apps, we usually will get stuck with a problem or a bug that refuses to be resolved, no matter what you do. In cases like this, programmers like you may need answers to questions related to various coding languages, development platforms, tools, APIs as well as services. Where can you go for the solutions you need? We had the same thought and after doing all the legwork, here are 10 are the best communities full of brilliant people who might have the answers you are looking for or tips that might be helpful to help you find the solution you need. 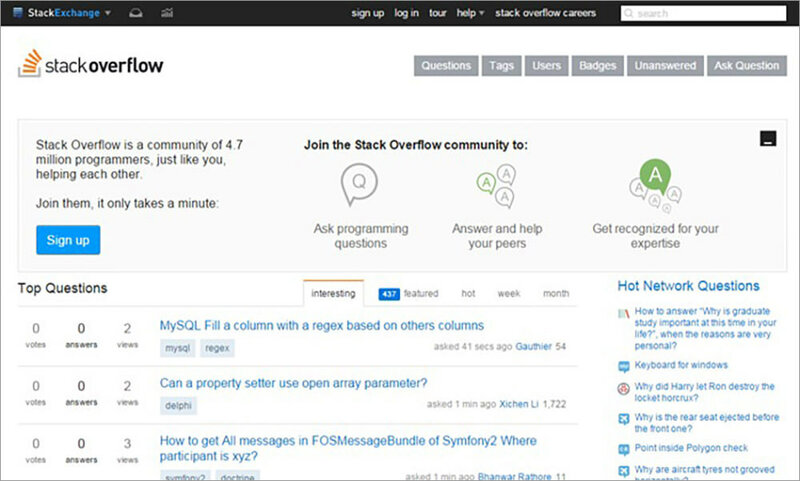 StackOverflow boasts a community of 4.7 million programmers who are serious about honing their coding skills. One can quickly ask questions (after signing up) on this site, or answer questions asked by others – even as a guest. 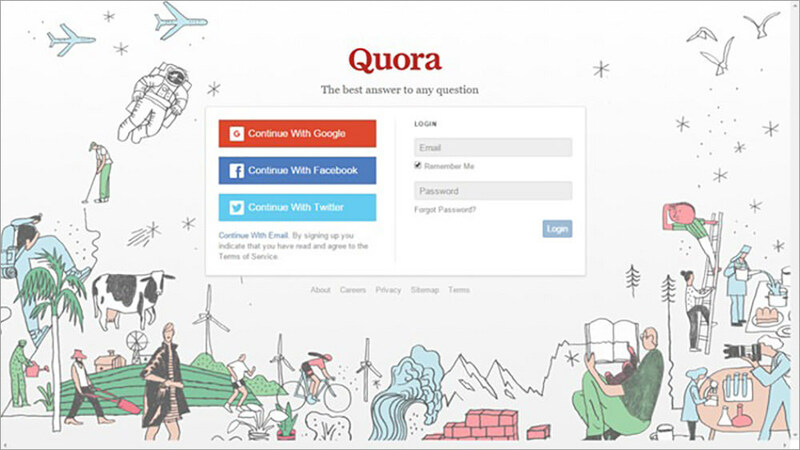 Quora hosts informative content created and shared by its users. Although it deals with a wide variety of topics and a majority of the answers you’ll find here are opinions from experts, it proves to be a valuable resource for programming and software development information . After signing up, you can ask questions by clicking on Ask Question and answer questions by clicking on the Write button in the top bar. There’s an up-vote system where you can award or get points based on the quality and relevance of the answer, and you can also view stats for your answers. For a serious programmer who values useful information, Reddit has long been one of the best places to visit. It has several communities that hold discussions about particular interests and topics including programming languages, computers, Internet, and more. One can easily post a link or submit a question after signing up for the site. AndroidDev, a popular community that hosts news, tutorials and other helpful information about Android app development, and more. 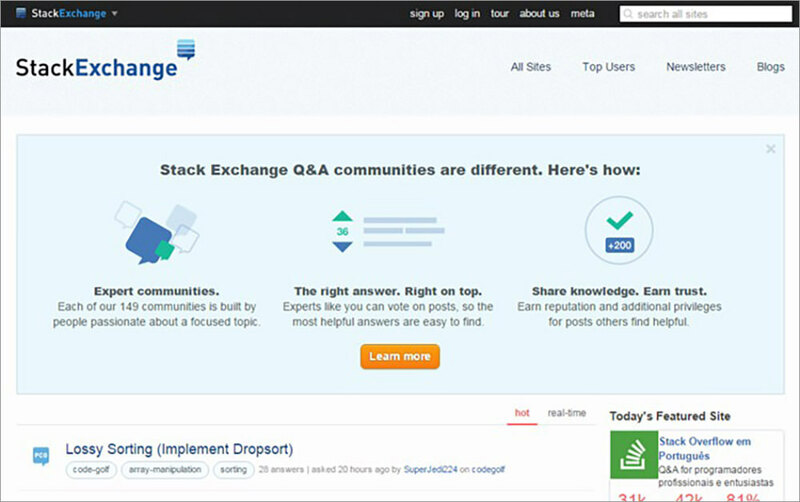 StackExchange hosts Question & Answer communities where people can ask and answer questions. Experts vote on posts and make sure that helpful answers are easier to find. You need to get an account to start searching for answers or answering a query. Ask Ubuntu: a group of Ubuntu newbies and super-users, and more. 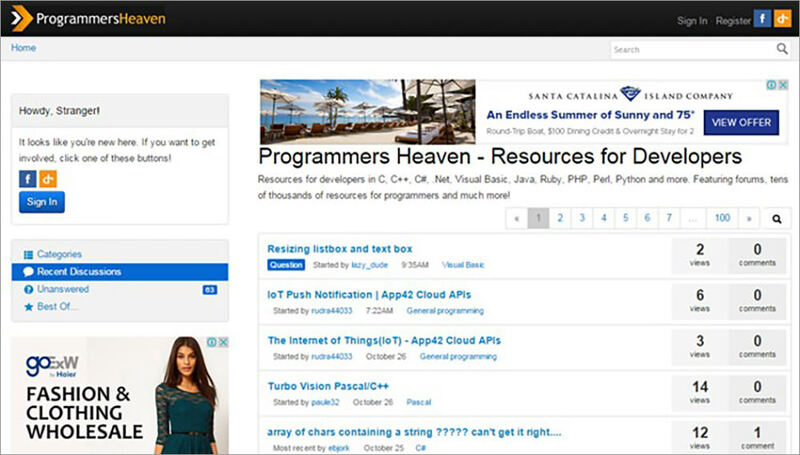 CodeProject is a website that offers coders helpful news, information and source codes. It has general discussion forums for software developers to share their thoughts with like-minded users in the community, as well as a Quick Answers section to ask question and receive specific technical assistance. Signing up lets you ask questions, post in discussion boards, and get weekly updates. Hosting a community of 11+ million users, its general programming forums are classified using tags based on programming languages, development platforms, and web services. Some of the popular topics dealt with are .NET, C#, C++, Java, Android, SQL, and Web. The site also has a constantly growing articles and discussions base, which attracts contributions from developers all over the world. Google Groups, a service from Google, is a place to create communities where people with common interests can get together, make discussions, and find help with issues. Google Groups allows you to create a question and answer forum or join one and interact with other like-minded people. To get started, sign in with Google, find the right group, join in, and start asking or answering questions. Question & Answer groups let members ask questions and answer the questions asked by other members – much like StackOverflow and others. Groups fall under categories and regions with sub-categories, for example, Computers have various sub-categories like Artificial Intelligence, Databases, Games, Graphics, Internet, Operating Systems, Programming, Security, Software, etc. Each category has various groups created by members – browse or make a search to find the best as per the requirements. CodeRanch, a discussion board for programmers, is an ideal place for novices to learn the basics of Java, Android and iOS programming, and post queries about the things they need help with. Sub-forums on databases, computer engineering, and other languages including C/C++, Ruby, python, and PHP are also available. One can easily register, join a sub-forum, ask questions, and reply to unanswered questions. The site even host other sub-forums, which discuss careers, products, frameworks, and more. Meaningless Drivel is for users who are there just to talk, Blatant Advertising is for people seeking exposure, and coding puzzles and fun challenges are discussed in Programming Diversions. With 280+ thousand registered users, this vital community holds the potential to help programmers past a hitch. Programmers Heaven offers resources including Question & Answer communities for developers and offers help in multiple languages and applications such as C and C++, Visual Basic, Java, VB.NET, PHP, and python. Posts are categorized under groups like Programming Languages, Applications, Mobile & Wireless, Operating Systems & Platforms, Software Development, Web Development, etc. The site places a Question tag next to query posts and an Answered tag beside answered ones (you can also locate and answer unanswered questions quickly). Discussion lists shows the number of views and comments for each post, which helps to find popular topics to view. To start using this site, make a search for required info or sign up and comment on others’ posts. A social network for developers, FindNerd is a great go-to website for querying on the technical aspects of various programming languages and practices. It’s a mix of freelance market and learning forum – providing best of both worlds with 0% commission charge. To get started, register on the site, and post questions or answer questions, or create projects, provide services, and collaborate with others. Signing up allows you to post questions, and blog on technical issues which other users may find relevant and useful. The site has developers’ community that answer questions to improve their work profile and can help in your project in better way for a small fee. The site also provides a free desktop recording tool for users who want help with an issue, but couldn’t sufficiently outline it in a query. An educational resource site, Chegg offers solutions and tips for students around the world. Some of the services they provide are online tutoring, homework help, help acquiring textbooks’ solutions, advice and news on internships and careers, etc. Just sign up for the site and ask questions for free. For programmers, the Computer Science section allows posting queries about Algorithms, Database Systems, Software Design, Operating Systems, Programming, and others. Experts from around the world provide assistance and tutoring in various subjects. Chegg Study, unlike the other sites on this list, is not completely free but will let you ask 20 new questions every month for free.